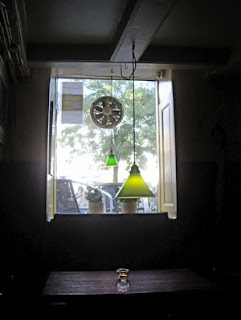 I love old taverns, and in Copenhagen they are out of numbers. At Kultorvet, or the coal market you find one that has be open for business over 200 years. 1807 was a turbulent year. Napoleon I attacked Russia, slavery was abolished by law in the British empire, and the first steam boat service was launched on the Hudson River by Henry Fulton. One day in this year the first proprietor of Hvide Lam opened the doors for business. Hvide Lam is truly a brown tavern. It has retained some of its run down charm, as its interior has escaped interior decorators attention for a very long time, and should remain so. Its walls, ceiling, and floor, is wonderfully politically incorrect, as generations of smokers have left a brown patina over it. Most of you may find this unappetizing but I, in spite of being a non smoker, do not. They do recommend their sandwiches s.k. håndmad, priced at DKK 48. I did however happen to see one of the compulsory (framed) reports left by the Danish Food Safety authority, where they award a smiley to serving establishments. When controlled in February 2008, the authorities had remarks, whereas the control report from October 2008 ended with none, and Hvide Lamb was awarded with one large smiley. The sandwiches at Hvide Lam is not prepared at the bar. If you would like to enjoy one of these treats in an authentic tavern, I would recommend Skindbuksen, where they prepare the real thing from scratch. 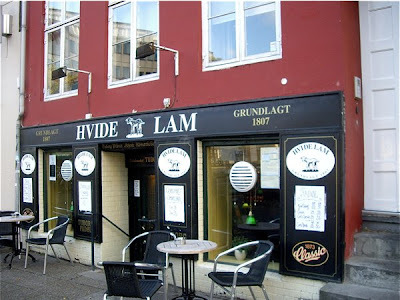 But a visit to Hvide Lam is worth while, to experience the Danish kneipe, one of the trade marks of this genuinely relaxed country.